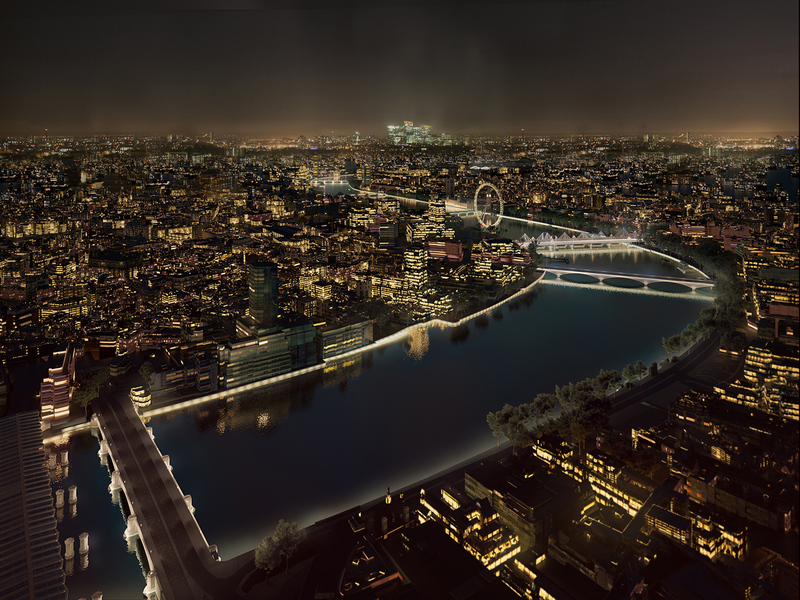 Six designs have been shortlisted for London’s Illuminated River competition, which will turn the capital’s 17 bridges into a £20m art installation. 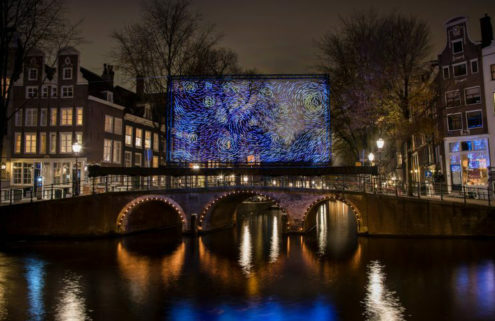 Architect David Adjaye plans to transform the bridges into a luminous gallery with his ‘Blurring Boundaries’ concept, for which he’s enlisted 31 international creatives – including artists Cai Guo-Qiang, Jeremy Deller and Doug Aitken – to create 17 site specific commissions. Meanwhile, Sam Jacob has opted for an ethereal approach with ‘Thames Nocturne’, which will use data from the river to create a ghostly visualisation of its tide projected between bridges. 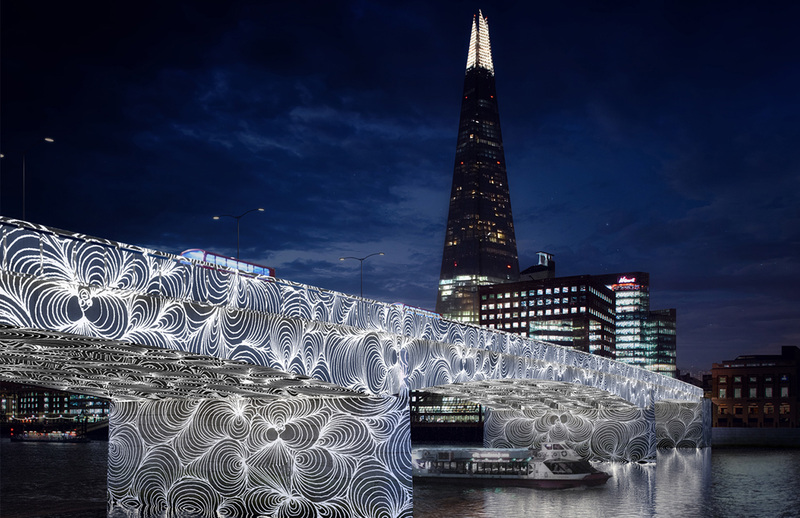 And MAAT designer Amanda Levete has chosen to light up the river’s walls and bridge elevations, showcasing them as engineered artworks. 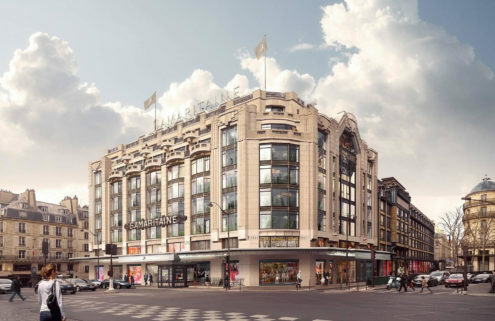 The six teams were selected from 105 proposals to create a masterplan for the capital’s road, rail and pedestrian bridges. ‘An illuminated river is an essential part of our night time economy, and of making London a truly 24 hour city,’ said Hannah Rothschild, chair of the Foundation. 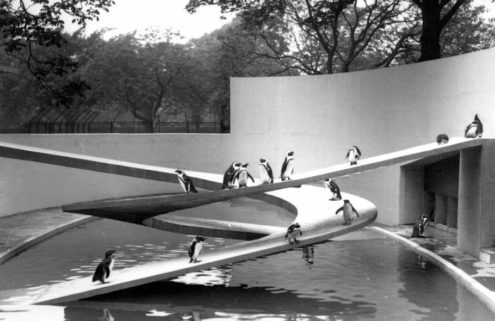 Other concepts include Leo Villareal and Lifschutz Davidson Sandilands’s graduated colour spectrum ‘Current’; Diller Scofidio + Renfro’s vertical light beams; and Lyon-based Les Éclairagistes Associés’ ‘A River Ain’t Too Much To Light’. The final winner will be announced on 8 December, with the permanent installation completed between 2018 and 2020. In the meantime, the designs are on public display at the Southbank’s Royal Festival Hall until 29 November.